As thanks to all who've followed, commented or viewed my sims makeovers and miscellaneous screenshots I've created three sets of painting recolors for Sims 2. I really love the Sims community. I've been downloading, hoarding and using custom content for ages but I've always wanted to contribute to the community as well. Thanks again to frankscrank for the tutorial! So, this is what I've got right now. 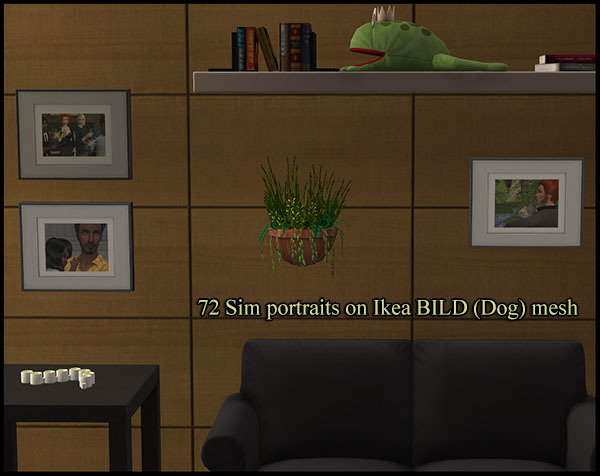 There are three sets, this first one is the largest set of 72 sim portraits on the Ikea BILD (dog) mesh. I included swatches and thanks to needlecream they are (hopefully) very clear so you can pick and chose the pictures you like. For these to show up in game you'll need the Ikea Stuff pack and HL's Ikea CEP extra. There are premade sims as well as a few of mine. For those that don't have the Ikea stuff pack there will be some base game sets soon. And for those who are able to use these, please let me know if there are any problems or suggestions as this is my very first upload.